How sure are we that Russian Kettlebell - 10 lbs. (4kg) will work for you? Simply fill out the form below and put Russian Kettlebell - 10 lbs. (4kg) to work for you right now. 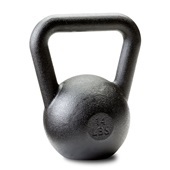 Obviously, we would go out of business if Russian Kettlebell - 10 lbs. (4kg) didn't work, the way we said, right? 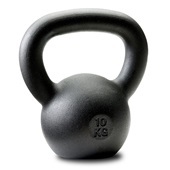 With the promise of a full refund if you're unsatisfied, you have nothing to lose by trying Russian Kettlebell - 10 lbs. (4kg). Go ahead and try it today. 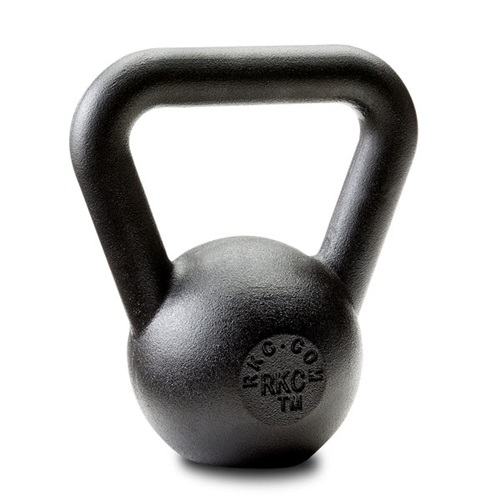 DDoor’s 10 lbs RKC kettlebell is uniquely suited to women's exercise needs. The 10 lbs kettlebell is one of our most popular initial sizes for those women eager to start shedding extra pounds, gaining energy and feeling more confident—when all else has failed. I use a pair of 10-lb "baby bells" kettlebells along with my 12-kg "Natasha" when I workout with the Femme Fatale video. ("Natasha" and I enjoy the swing--one of my favorites!--as well as other exercises) The pair of 10-lb kettle bells are used when when I do one-legged dead lifts, the windmill and the dragon walk. I chose the the 10 pounders so that they would not overload my shoulders (I've had shoulder injury in the past--so tend to use caution.) These "baby bells" add great dimension to my workout--I'm very pleased with them. 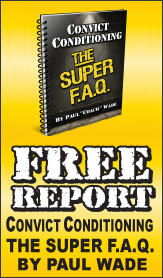 This is a perfect piece of execrise equipment to add to any workout routine. Yes, I admit that as a man, I was ashamed to order a 10 lb bell, as my 1st, when the protocol suggests that an average man start with a 35 lb-er. However, for us slightly older comrades (45), who have spent the last decade sitting behing a desk 50+ hours a week, jumping straight to the 35 seemed foolish. The 10 lb bell is even lighter than the average ladies' starter, so there were some initial feelings of sissification when I started. Turns out this middle-aged geezer knows what he's doing. After 3 weeks, I have comfortably moved up to the 18 lb bell, and my creaky shoulders feel great after a workout. Easing into this challenging new skill set was the smartest way for me to go, and the light bell helps me concentrate on correct form, thus reducing my chance of injury. The manly efforts with a 35 lb-er will come in time, and when I get there, I will have a solid foundation, with good form, and some seriously rehabbed shoulders. Men, I'm telling you... if you are slighty older, an out of shape desk jockey, and weigh under 160 lbs, don't let your machismo dictate what size bell you start with. Use your brain, and start small. You'll be very surprised at the level of intensity you can generate with this 10 lb bell. It feels rock-solid, well balanced, and even though it's small, it packs a whallop. If your friends laugh at you, just tell them it's your daughter's kettlebell. A little humiliation beats a torn rotator cuff any day, no? Start light, then move up. Your body will thank you. Rated 10/10 Dragon Door Kettlebells Rule! I'm 66 and started out with a pair of 10 pounders about 3 months ago. That was a perfect starting weight for me. I've worked up to using a pair of 26 pounders for seesaw presses in a very short period of time. I've discarded my pressing bench, barbells and dumbbells. Kettlebells are all you'll ever need to get fit! I LOVE my Kettlebells and Dragon Doors are the world's best, they'll last your lifetime and beyond if you keep them painted to prevent rust. Don't waste your money on inferior brands! I got the 10lb bell for my wife and she loves it! the grip is perfect for her small hands. Now we are both turning into kettlebell fiends! My wife was very interested in my kettlebells, but they were of course to heavy for her. She is in her mid-fifties, and needed to start out slow. The 10 pounder was absolutely perfect. It is a good weight for her to handle, and the smaller size is also, I believe, less intimidating for someone just starting out. Nice quality and finish, too. Rated 10/10 Tough little bugger! This 10lbs bell dubbed "Doushka" joins "Raisa" (18lbs), "Boris" (35lbs) and "Ivan the Terrible" (53lbs) as the lady of the family. It will be used by my wife and daughter as a primary KB. 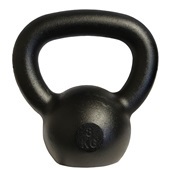 I have had my own set of 4-kb kettlebells for several years and have used them the most. I also have 6-kb, 8-kb, and 10-kb pairs. I love all of them. 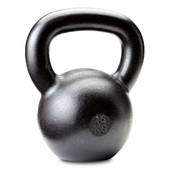 I purchased 2 10-lb kettlebells for my daughter for Christmas because she has been threatening to take mine. She had a shoulder injury last year (playing rugby), so I want her to concentrate on correct form rather than heavy lifting for now. I will give her bigger kettlebells in the future, which will be better than her current weight lifting - putting her boyfriend over her shoulder and carrying him around! We keep this handy to use when we have a few seconds. Actually, it was bought for my 2 year old who always wants to do what dad is doing. A five pounder would be great or even a 2 1/2 pounder. Rated 10/10 Perfect size for beginner! 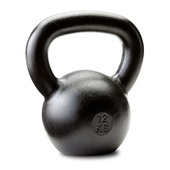 This is the perfect size kettlebell to accompany the Goddess workout as a beginner!